The C.B. Cox Stakes – now known as the Ted Van Heemst Stakes – is one of the key races of the annual Perth Summer Racing Carnival and takes place at Ascot Racecourse on a Saturday in late December. Run a fortnight later after the Group 1 Kingston Town Classic (1800m), the Group 2 Ted Van Heemst Stakes is contested at weight-for-age over 2100m and offers $400,000 in total prize money. It is the sole Group race on the Perth race card at the summer meeting and is supported by the $100,000 Listed Starstruck Classic (1600m) for local milers. The Kingston Town Classic – Ted Van Heemst Stakes double was most recently completed by Pounamu (2017). The Ted Van Heemst Stakes makes a good lead-up to the Group 2 $500,000 Perth Cup (2400m) back at the track in late December or early January and the double was last completed by Delicacy (2015-16). The latest edition of the Ted Van Heemst Stakes runs on Saturday December 22, 2018. The full Ted Van Heemst Stakes 2018 Results & Finishing Order will be published below once the race is run and won on Saturday December 22, 2018. Ted Van Heemst Stakes betting markets are released the week of the race once the official field of Perth Cup hopefuls is announced. Proven Perth performers dominate the Ted Van Heemst Stakes betting markets, bookies favouring the best out of the Kingston Town Classic in the lead-up. Genuine staying types and those with a good Ascot strike-rate sit at the top of the Ted Van Heemst Stakes markets and the favourites have a gun recent record in the race. The last double-figure CB Cox Stakes winner was God Has Spoken ($14 in 2011) who backed-up with a Perth Cup second next start at a similar price. The season’s best Ted Van Heemst Stakes 2018 betting odds will be provided below on the season’s summer stayers so stay tuned for the top Perth racing markets. The summer’s Ted Van Heemst Stakes field attracts a line-up of mainly WA-trained stayers heading towards a run over the mile and a half back at Ascot in the Perth Cup. 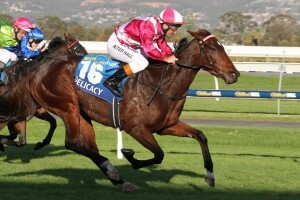 Group 1 winner Delicacy (2015) is a standout Ted Van Heemst Stakes winner when the race was run as the CB Cox Stakes. Photo: Jenny Barnes. Many of the runners in the Ted Van Heemst Stakes field are graduates from the Kingston Town Classic held a fortnight before. Recent Ted Van Heemst / CB Cox Stakes winners to come out of the Kingston Town include Pounamu (2017) who did the double, Delicacy (2nd in 2015), Railway Stakes winner Elite Belle (3rd in 2014) and Ihtsahymn who completed the double in 2013. The official Ted Van Heemst Stakes 2018 Final Field & Barriers will be published in full below the week of the race so stay tuned to see what Perth stayers making the starting line-up this season. Top Ted Van Heemst Stakes tips include looking for proven stayers with past winning form over the distance, locally-trained hopes with a good Ascot record and the graduates running on well in the Kingston Town Classic the start before. Runners under $10 in betting have a dominant recent record so tipping an in-form galloper at singles is also a good Ted Van Heemst Stakes tip. Our Ladbrokes’ insider Ted Van Heemst Stakes 2018 tips and Perth racing selections on the staying clash this summer will be detailed below the week of the race so stay tuned for the gallopers to back and sack in the lucrative Group 2 W.A. race. The Ted Van Heemst Stakes form guide features all the crucial information punters need to place a wager on the summer staying showdown including the jockeys, trainers, barriers and lead-up form of the runners in the race. In recent years the CB Cox Stakes / Ted Van Heemst Stakes form has stacked up plenty of times in the Perth Cup the next month as well as in the next year’s Melbourne Autumn Racing Carnival features like the Group 2 CF Orr Stakes (1400m). The 2012 CB Cox Stakes winner Mr Moet ran second in the 2013 CF Orr Stakes. A link to a comprehensive Ted Van Heemst Stakes 2018 Form Guide will be provided for punters below once final acceptances close. Short-priced favourites have dominated the C.B. Cox Stakes / Ted Van Heemst Stakes results over the past decade. Notable recent CB Cox Stakes winners include Delicacy (2015), Ihtsahymn (2013), Mr Moet (2012) and Lords Ransom (2009).